I find that I have considerably more patience with the task of explaining the meaning of atheism and correcting misconceptions about it with religious believers than I do with other atheists. I realize that may be unfair, but I suppose I expect that those calling themselves atheists will know what the term means. Needless to say, such an expectation is an error on my part. There is at least one serious and common misconception about the meaning of atheism, held by theists and atheists alike. I have written several posts on the meaning of atheism, but they have resolved little. The questions keep coming. Odds are good that this post will not change this situation, and so this is unlikely to be the last time I find it necessary to address the meaning of atheism. That does not mean it is not worth the effort though. If those of us who identify ourselves as atheists cannot be clear on what atheism means, we have little reason to expect others to understand it. In looking back over some of my previous posts on this subject, I daresay I said it clearly the first time I addressed it even though I may have diluted what I was attempting to communicate in the rest of the post. Simply put, atheism means the absence of theistic belief. That's it. It doesn't mean anything else. Atheism is not a religion, a philosophy, a worldview, or anything similar. It is not the conviction that there are no gods, ghosts, angels, etc. Rather, it is the absence of a belief that these things are real...Atheism is nothing more than the lack of belief in a god or gods. Reasons why people become atheists are varied and are some are useful for understanding atheists. Some are more common than others, but they are not particularly relevant for understanding the meaning of atheism. Again, an atheist is simply someone who responds with anything other than "yes" to the question of whether he or she believes that god(s) exist. Atheism comes from the Greek "a - theos," and since the "a" prefix means "without" or "the absence of," we must first make sure we understand theism. Theism refers to the belief that some sort of god or gods exist. A theist is one who accepts the theistic claim (i.e., some sort of god or gods exist). An atheist is one who does not accept the theistic claim. 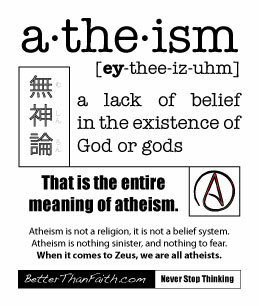 That is, atheism means "without theism" and refers to the absence or lack of theistic belief. Now that we know what atheism is, it is time to examine what it is not. This brings us to the common misconception to which I referred above. Atheism does not require absolute certainty that god(s) do not or cannot exist. Some atheists may indeed claim such certainty. These individuals are sometimes described as "strong atheists" or "gnostic atheists." Nobody disputes the existence of such atheists. The point is that certainty is not a necessary condition of atheism. One who asserts that there "probably" are no gods is still an atheist. In fact, one need not assert anything to be an atheist. One need only refuse to accept the theistic belief claim. I suppose this should be the part of the post where I list as many misconceptions about the meaning of atheism as possible in order to more fully explain what atheism is not. Such a list would include terms like Communist and Satanist. It would also have to include things about how atheists do not hate any particular god, are not merely looking for excuses to be immoral, and so on. I'm not going to do that here because I trust that most of my readers will already be aware that these are misconceptions. For those who aren't they can be addressed in other posts. Why Should We Care About Defining Atheism? Let us dispense with all the obvious reasons why accuracy is preferable to inaccuracy and why dictionaries are not necessarily above reproach. We can keep this brief: defining atheism accurately reduces epistemological confusion and reminds us where the burden of proof rests. I am willing to cut theists, particularly evangelical Christians, considerable slack in misunderstanding atheism. I know all too well what they have been taught about atheism (and atheists) and why. To my atheist colleagues, this is where we should be expected to lead. Until we can accurately define ourselves, it is folly to expect anyone else to do the same. I have written previously that I do not find distinctions like "strong atheist" or "passive atheist" to be particularly useful. This needs some clarification. I believe that such distinctions may eventually be meaningful as ways of describing within-group differences. However, I maintain that they are not useful at present because too much confusion remains over the meaning of atheism itself. Within-group distinctions are premature when the group itself is as fuzzy as we have allowed atheism to be. I do refer to myself as an agnostic atheist at times because that is an accurate description; however, I generally prefer to shorten my self-identification to atheist when I am communicating with people who do not understand atheism.